Connecting different tools and services to your Slack workspace makes your team more efficient. How? Imagine having important information from the variety of tools you use every day funneled right into Slack channels where your team can analyze, discuss, and decide on what to do next. Let’s take a look at a handful of ways that teams of people bring their data into Slack to speed up their progress and help them make more informed decisions together. Which marketing campaigns are hitting their goals and which ones are missing the mark? Who is our unhappiest customer and how can we address their needs? These are some common questions marketing teams need to answer and—thanks to a range of available apps and integrations—the key to finding those answers can be searched for in Slack. For example, Net Promoter Score (NPS) is a popular way for companies to track general customer satisfaction, and there are a handful of NPS apps for Slack that send customer survey responses automatically to a specific channel. Once you have customer scores streaming into a channel with sales and marketing folks present, members who spot negative scores can immediately start a thread to discuss the review. Giving this much visibility into customer satisfaction data means that anyone in the channel can share negative NPS results to other channels in Slack so relevant experts from other teams, like engineering and customer support, can start diving into solutions. Account managers will also immediately know when customers are having a less-than-stellar experience so they can reach out right away to help remedy the situation. Zendesk is a helpdesk service that (according to their website) is used by more than 200,000 organizations worldwide. Once you add Zendesk to Slack, you can automatically send all your support tickets into channels. Say you created a Slack channel for all completed Zendesk help tickets. Now, when new staff join the support team, they can get up to speed faster by searching the channel for tickets containing keywords similar to ones in their queue of unresolved tickets. They can then base their answers on previous approaches that worked and respond to the customer quickly. You may also want to set up a channel containing all incoming helpdesk tickets, so support staff can easily share those thorny problem tickets to other channels where expert specialists in the company can quickly answer questions and help find solutions. 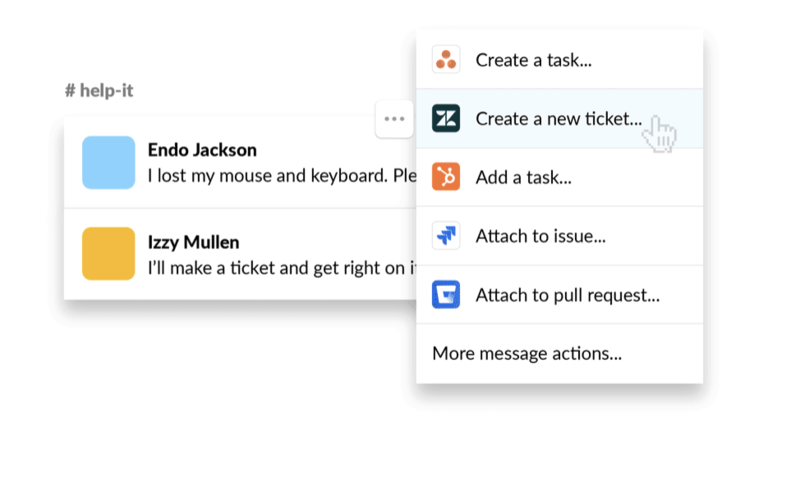 On the flipside, you can also use the new Actions feature to turn any Slack message into a new support request in Zendesk, which can be especially useful for tracking and organizing things like internal IT support requests from employees. Concur is a service for coordinating employee travel, expenses, and invoices. For employees, it’s often a hassle to log into separate systems to periodically book flights, check flight data, or set aside the time to document monthly receipts and expenses. Thanks to Concur’s new bot, you can do a lot of those tasks without leaving Slack. Check your upcoming flights and get data back instantly, create new expense reports, and upload receipts, all from Slack. And for finance teams signing off on these transactions, the bot sends approval requests to individuals as Slack direct messages, ready to be accepted in a single click. Salesforce is one of those killer apps in every sales team’s quiver of tools, and its app for Slack is useful for doing things like looking up the status of accounts and sales leads inside of Slack. The service Troops expands and extends what you can do with Salesforce data in Slack, so your team can get automatic messages sent to channels to alert everyone when sales contracts have stalled (reach out to save them! ), when new leads come in (say hello! ), and when sales deals are closed (break out the champagne!). Bring tools like Asana into Slack, and you’ll increase visibility for a project’s timeline as well as add full context for discussions and decisions made along the way. Create a project channel and have Asana send updates when milestones are completed or new tasks are added. Once you do this, you can reduce the volume of regular status meetings that take team members away from their work, because everyone can stay abreast of the project’s progress in the channel. Asana’s app for Slack also uses Actions, so you can turn any good idea posted in Slack into a new Asana task. Streamlining the common tasks your team tackles in their daily work is often as easy as finding the apps that you use regularly in our App Directory and incorporating those tools into Slack. Use integrations to pull relevant data into team discussions, document decisions, and increase visibility around issues and opportunities so that the right people can act swiftly and keep things moving. 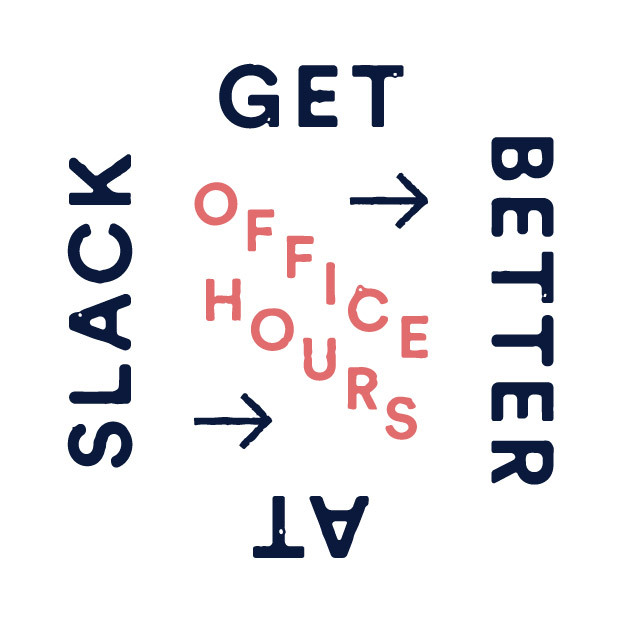 Join us at Frontiers, a conference by Slack, where we’ll share more tips and best practices to help leaders and their teams create the right conditions for collaboration and explore new ways of working together.